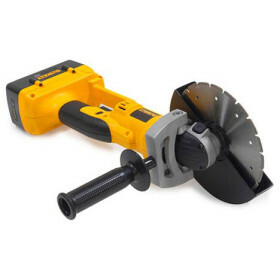 Broco® 36V Mini Breaching Saw » Protective Solutions, Inc. The Broco® Mini Breaching Saw Kit powered saws for forced entry and rescue. It is a 36 volt cordless cutoff tool. It races through steel, concrete, and polycarbonate (plexiglass), and is ideal for cutting chains, hardened locks, window bars, door hinges and bolt throws. It can also slice through vehicle sheet metal, including 'B' pillars, and laminated safety glass. The Mini Breaching Saw is lightweight and easy to carry. The high performance Broco blades feature a double layer diamond brazed cutting edge for long blade life and smooth performance. The Broco® Mini Breaching Saw is the portable saw that does it all.